This week was a bit different as I wasn’t necessarily tinkering with electronics and ardiunos as the past week, however, it was still a very interesting time. This week, I worked with the Digital Embroidery. Essentially, I got to play with a sewing machine times like 100. Machine embroidery is an embroidery process whereby a sewing machine or embroidery machine is used to create patterns on textiles. It is used commercially in product branding, corporate advertising, and uniform adornment. Hobbyists also machine embroider for personal sewing and craft projects. In the scope of the Fab Lab, the machine are more for hobbyists. So this is how the process went. We started on computers and were instructed to find a picture. However, we had to do this with wisdom. We needed to make sure that our pictures weren’t composed of a lot of colors as when the picture is loaded into the machine, each color recognized by the machine will mean a swap of thread. So in order to make sure our images were simplified, we used the Sew Art software to deprecate the colors of our images to just a few. After doing our edits in Sew Art, we then pushed things to a USB drive and headed for the sewing machine. We loaded the image into the machine via a wired connection and here comes the hard part–threading the sewing machine. To thread the sewing machine, we had to follow a very simple, but important, 7 step process which compared to threading a simple needle, was a lot more… different. After we threaded the machine and push our fabric down, I was only a button press away from my awesome design. Below are some interesting images and videos of what the machine looks like and how the machine works. 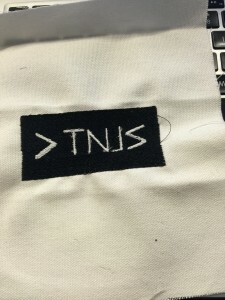 What does Digital Embroidery mean for me? I don’t know if it means much for me as I’m not sure if I would be interacting with such technology on a regular basis, however I think this could mean a world of a difference for the maker. I feel that this expands the domain of what a maker is. I think that this technology can also have a huge effect on design as it would allow for intricate designs to be created and produced in a very quick manner. Small time designers or hobbyists would find it very easy to put their designs on different products. With that being said, though I don’t see myself being a regular user or enthusiast in this technology, however, I would say that I am definitely an ally for the increased popularity of this technology! Hey, Toheeb! 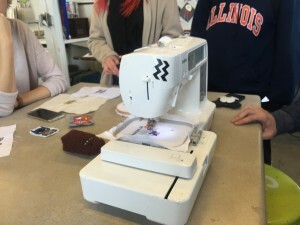 It indeed does not help too much on our projects, but digital embroidery might be just an open learning opportunity to help most of the people get experience on different types making tools.The functions of sewing machine are very similar to a 3D printer. I guess we could make some comparisons between two technologies. Toheeb, I agree with you here in that I am not sure how much I will be interacting with this technology. I do not seem myself as they type of hobbyist to sit down an embroider for fun, however it was still great to learn. Enjoyed the post!